Whether guiding a raft through the Grand Canyon on the Colorado River, or writing songs and singing about the majesty of the American West, Melissa Crabtree’s heartfelt love for the natural world transports her listeners to the wild places she knows best. Melissa, you see, lives two lives; one as a wilderness guide and the other as a working musician, and at this intersection of nature and music, she conjures songs—like a contemporary, female Woody Guthrie—that amuse, inspire and entertain. In performance, Crabtree delivers her poignant stories in a distinctly husky alto, with a pleasingly twangy guitar. Her band is top-notch and is as comfortable playing on the back porch as they are on a festival stage. 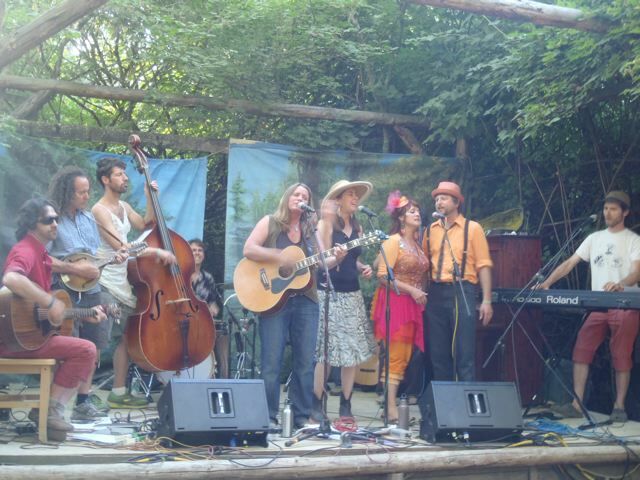 In the last several years, Melissa has played many notable festivals, including the High Sierra Music Festival, Moab Folk Festival, Oregon Country Fair and the Taos Solar Music Festival. She has also received songwriting awards at the Telluride Bluegrass Festival, The Rocky Mountain Folks Festival, The Tucson Folk Festival and the Kerrville Folk Festival. In 2002 she was among the 10 finalists in the Songwriter’s Showcase at both the Rocky Mountain Folk Fest and at the Tucson Folk Festival. In 2004 she was among the top five finalists in the Telluride Bluegrass Festival's “Troubadour Contest.” In 2006 her song “Message from a Soldier" got the attention of Noel “Paul” Stookey (of Peter, Paul and Mary) who invited her to perform at the Kerrville Folk Festival where she was a finalist in its "Music to Life" Public Domain Foundation songwriting contest. Melissa also received honorable mention for the song " Message from a Soldier" in the 2010 International Songwriting Competition, hailed as "The songwriting competition to take note of" by the New York Times. Kasey Chambers from Australia and Carrie Rodriguez were finalists the same year. She released her first CD, “Off the Beaten Path,” in 2002 and then toured the country in a vegetable-oil powered van to call attention to our nation's addiction to petroleum. Her song "Biodiesel Van" was featured in the film "Fields of Fuel" which won Best Documentary at the Sundance Film Festival in 2008. She also produced a compilation CD of songs and spoken word about alternatives to fossil fuels that includes Julia Butterfly Hill, Tony Furtado and Julie Wolf (of Ani Difranco’s band). If you want to support my music and touring OR you purchased a CD at a show and were unable to pay, you can send money at this link!